These are just a few of the problems that can suddenly surface. Without the protection of title insurance, you'll be in jeopardy of losing your investment. Are homeowners helpless against these and other pitfalls? Absolutely not. You can safeguard your real estate investment against these and other "horrors" with owner's title insurance. First, a service known as a title search describes, as well as possible, the condition and quality of the title to the land you are buying. Then, your title insurance protects you against mistakes or threats that might otherwise result in financial loss to you - including those hidden, unknown items. 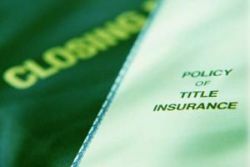 There are two basic types of title insurance protection. One for the mortgage lender and one for the homeowner or real estate investor. If a mortgage is to be placed on your new home, the mortgage lender will probably require that you purchase title insurance to protect the institution's position as a holder of a mortgage loan. But this mortgagee's title insurance policy doesn't protect you, the homeowner. You need an owner's title insurance policy to protect your investment.